well, you can write to him, to inform him. 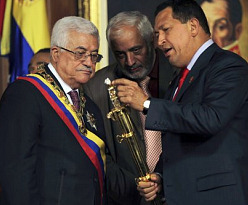 Abbas’ crimes against his people are well documented Brian, I’m sure that Chavez is aware of them. Sure he is but he had to say it to somebody. Chavez also made a special deal of inviting Robert Mugabe of Zimbabwe to a recent conference in Venezuela, calling Mugabe a “freedom fighter”, cast doubt on whether or not Idi Amin really committed atrocities, and praised Carlos the Jackal on national TV last week. On Chavez recent tour of world dictators he and his entourage made a special stop in Venice Italy where they took over an entire floor of a five-star hotel, so he could get some strokes from the Hollywood types. Meanwhile the poor continue to live in cardboard shacks in the ditches of Caracas. In response to an ongoing water and electricity crisis, Hugo went on TV and told people they could solve the problem by taking 3-minute showers. Did you know that the Chavez gov’t has built LESS housing than the previous government? That food imports to Venezuela have risen 900% since 1998? As a side note, the recent budget request for Miraflores Palace where Chavez lives included US$850,000 for toiletries. Anyone interested will find all of these statements corroborated by reputable and mainstream news sources, if you care to check.